With the destruction of the Papal army in the Siege of Forli, two parties make their way back to Rome. The first is Hernando de Caballos (Robert Cavanah) and Benito Sforza (Noah Silver), the Spanish general who served as the second in command for the siege, and his prisoner, the son of the Lady of Forli. The other is Juan Borgia (David Oakes), the Pope’s son and head of the Papal armies, who deserted and fled the battle when the siege was attacked from the rear. Back in Rome, in pain and in shame, Juan is even more demanding than usual while bragging of his false deeds before the Pope. Oakes gives a weighty performance through much of the episode- that of a prideful man, broken and descending into madness by way of self-delusion and drug use. One soft spot was the late night talk with his father, which seemed a bit off kilter- but that may have been intentional. And, Juan’s pride and how he is handling it will likely be his downfall, an enviable task for Oakes to carry out. 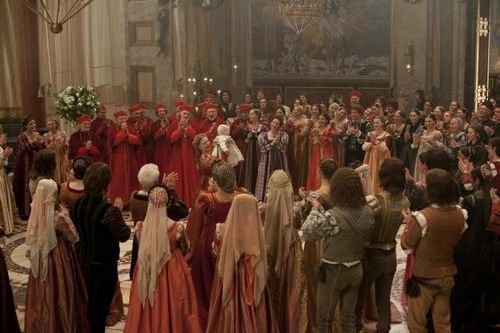 One of the Borgias central themes has been the bitter rivalry between Juan and his brother, Cardinal Cesare (François Arnaud). After Hernando informs him of his brother’s actions and telling him about Benito, Cesare conspires for the boy and his father to meet. Pope Alexander VI, aka Rodrigo Borgia (Jeremy Irons), encounters the Benito alone in the damaged Basilica. While Irons has shown the Pope’s ruthlessness to his enemies, real and imagined, he has portrayed a tenderness to children and the innocent. The nuances in his performance throughout the series, especially when it comes to showing compassion to said children, continues to be remarkable. Despite the fact that his character sent the army to break or murder this boy’s mother, Iron’s shows us the faltering of the Pope’s will when confronted with the human face of an unintended victim. Which sets up the return of the Benito Sforza while providing proof of Juan’s lies to the Pope. Concurrent to the more masculine intrigues, we arrive at the mother and daughter of the Borgia, Vannozza dei Cattanei (Joanne Whalley) and Lucrezia Borgia (Holliday Grainger), respectively. With another marriage alliance needed, the Pope pressured Grainger’s character to get married, though she has resolved to not be married off like cattle. To solve the problem of Lucrezia’s wandering heart, Vannozza suggests a novel solution; marry the suitor and take his brother as a lover. This will let the Pope gain the alliance he need, and let her cheat the system. And while Grainger plays the part well, it is Whalley’s performance in handling the Pope and subtly coercing her daughter that shines most brightly. Antonello (Jessie Bostick) is the young monk who will become the weapon of Giuliano Della Rovere (Colm Feore) against the Pope. Bostick’s performance has been from somewhat innocent to outright creepy in this episode. His emotions seem to have bled out of his portrayal as his character is prepared. This is highlighted in his vacant description of eliminating an obstacle to the plan. His representation is all the more chilling given where his character began. This episode has set the major parts of the final two episodes of the season into play; now to see if they deliver the story as strong as the actors. One of the things I am doing now is professionally reviewing various television shows/episodes and movies. Currently, most of the reviews are hosted at PopDecay, “a leading online news, politics and entertainment information delivery service.” The reviews that go up there are the Streamlined reviews, whereas the ones I post here will be the Robust reviews. Enjoy, and let me know what you think- civilly, of course.